Little changes in the bicycle world. 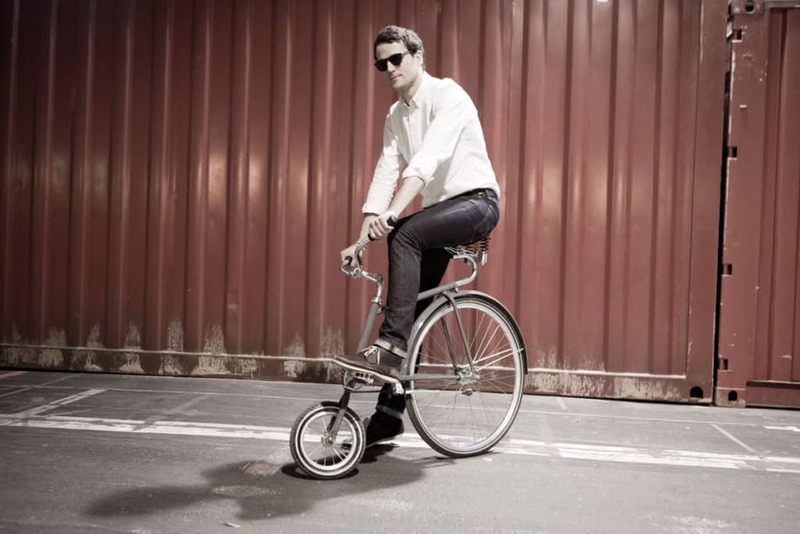 Chances are you’re cruising around on a diamond-framed bike. And why not? Diamond frames are an awesome and ubiquitous design, despite being over 100 years old. However, a few daring designers have attempted to break the mold, to reinvent the wheel. The results are evocative, unique, and oftentimes completely hilarious. 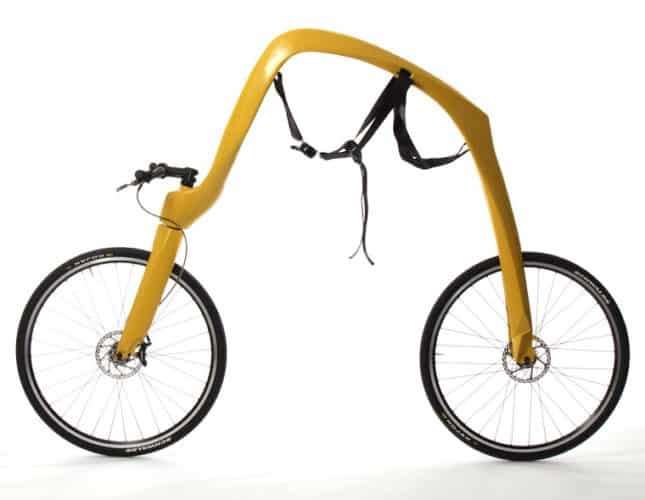 Here are six bizarre, unique bicycle designs that I’m totally in love with. With a curving tail of a seatpost and handlebars positioned low near your knees, the design isn’t exactly ergonomic. Or practical. Or safe? It also has an undeniably antique presence. You’ll be sorely tempted to pull out your argyle socks and waistcoat. I’ve heard multiple theories explaining the strange design. The most plausible one suggests that the tiny wheel allows a rider to throw their arms out and prevent a collision with a pedestrian. See this image. 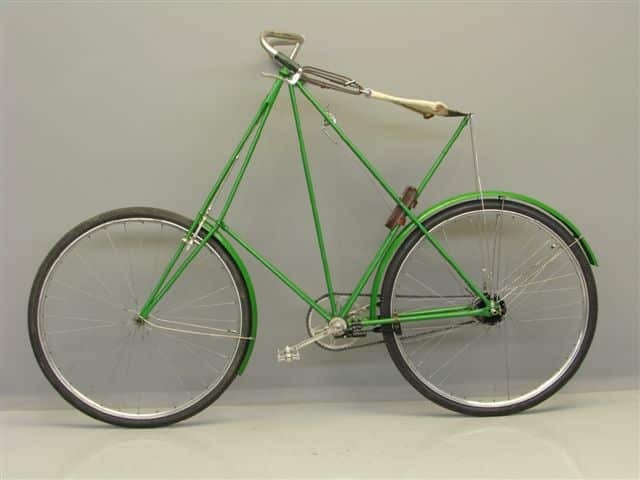 Abici sells a modern version of this 1930s classic. It’s hard to categorize the Pederson. It’s one part antique, one part chopper. In any event it’s bizarre, beautiful, and cuts a fine figure. One creative idea is the hammock seat. Some modern renditions of the Pederson have gone with a more standard design, and I think that’s a shame. Rather than protruding from the seatpost, this saddle is strung like a spiderweb. The bicycle’s Danish designer, Mikael Pederson, postulated that the hammock would provide suspension over bumps and jolts, all while saving weight. That was something sorely needed in the 1920s. If it turns your head, you can find modern versions still being produced today, with technological improvements like Nexus hubs. The diamond is a pretty robust structure. Most diamond frames have a seat tube running through the middle, forming two triangles. But Viks Bikes, out of Estonia, has discovered that a single diamond is plenty strong. Their unique frame does away with the seat tube, creating an utterly compelling silhouette. It’s seriously gorgeous. They double up the frame itself, and also include a custom one-piece fork and handlebar. A deep front cutaway for the wheel completes the look, and the end result is ultra modern, sleek, minimalist and stunningly good looking. I hear they’re pretty incredible to ride too. Canadian Lou Tortola found that traditional diamond frames lacked vibration absorption, lateral stiffness, pedaling efficiency and overall comfort. So he set out to design a frame that would address all those issues. The result is the Roundtail. It’s novel, it’s unique, it’s… round? Tortola’s theory goes that the seat tube transmits impact and vibration directly to the user’s spine. Over time that manifests as spinal pain, discomfort and fatigue. The dual rear circles (forks?) reduce that by up to sixty fold. I salute my fellow Canadian for thinking outside the box and challenging the triangle’s industry dominance! They’re available in mountain, hybrid and road form, and you can order them on Roundtail’s website. I live in a city with rampant bike theft, so aside from having a super strong bike lock, I like to store my ride inside wherever possible. 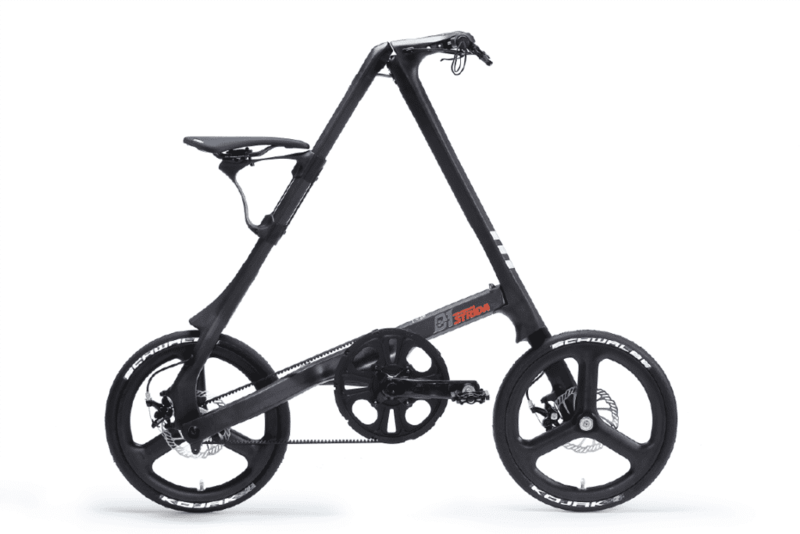 That’s why I absolutely love the adorably strange-looking Strida. It’s fun, it’s zippy, and it folds up to the size of a golf bag, which you can roll around. They achieve this by letting you safely break down the frame. It’s a quick process that takes less than 30 seconds. The frame is quite unexpected, a sole triangle rather than a diamond. The seat is placed on the rear tube, but it’s very upright and comfortable to ride. The tiny wheels don’t achieve a crazy top-end speed, yet it’s quick, agile, and fun. I could not resist including the Fliz, one of the most utterly bizarre bicycle frames I’ve ever found. Unlike most of the bikes listed here, this is just a concept and not available for sale (yet.) But unlike many concepts, designers Tom Hambrock and Juri Spetter actually produced a physical prototype. And then they scooted around on it a bunch and took photos. 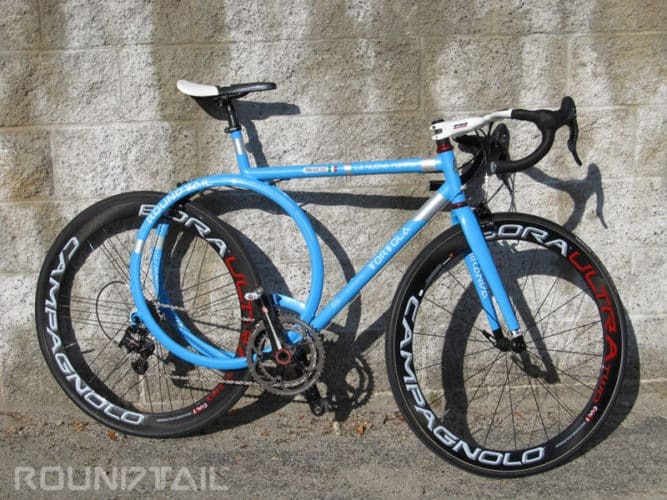 Part Fred Flinstone car, part Chindogu, this oddity might have you feeling more like a hang glider than a cyclist. It might look strange and perhaps reminiscent of childhood. However, remember that grown adults were zipping around on wooden dandy horses before the bicycle fully arrived. Hambrock and Spetter say that was part of their inspiration. By strapping into the frame and letting your legs do all the propulsion, you can scoot around town like an oversized toddler on a balance bike. It’s hilarious and I’m absolutely enamoured with it. When does it arrive in shops? I’ve barely scratched the surface with this list. There are so many interesting cycle concepts that it’d be impossible to list them all in one article. Recumbent bicycles, folders, antique oddities, there’s an endless supply. What’s your favourite crazy bicycle frame concept?